The Wisconsin State Legislature has finally gone back to work! This week both the Senate and the Assembly met to debate the newly drafted budget bill fresh from the Joint Finance Committee. The bill, passing out of the committee on party lines, included new changes causing controversy amongst legislators as well as Wisconsin citizens. The Senate received the bill on Tuesday and spent the day adding and removing items on the floor. After a full day of debate, the bill passed out of the Senate with the inclusion of prevailing wage repeal and without the controversial, 11th hour, open records language. Once in the hands of the Assembly, the bill received no further changes and was messaged to the Governor’s desk with a vote of 52 ayes and 46 noes. Governor Walker now has the ability to veto any item in the budget bill before signing the document into law. As of now, it is unknown when he will finalize the bill, but he does have some incentive to finish the veto process as soon as possible. Members from his team have stated he is planning on announcing his run for President this coming Monday, July 13th. The $73 billion budget contains a number of changes and additions since its first draft was released in February. To learn more about the current document, read on for a brief over cap of some of the most controversial issues, or click here. Prevailing wage – The Senate voted to include a partial repeal of prevailing wage on a vote of 17-16. The new language would repeal prevailing wage requirements for local governments and instead require the federal standard. Transportation – The bill reduces the Governor’s proposed bonding limits by $350 million. The reduction in bonding will lead to delays in current and future road projects including the zoo interchange in Milwaukee. UW System – The Governor’s original plan of an UW Authority was eliminated and the overall cut was lowered by $250 million. Students will continue to benefit from a freeze in state tuition. Senior Care – The budget bill will restore the Governor’s proposed cuts, fully funding the program. K-12 – Funding for Wisconsin public schools will remain the same as the previous budget with a slight increase of $69 million in second year of the biennium. Taxes – The final budget motion increased the deduction for married couples, reduced the alternative minimum tax, allowed teachers a $250 per year tax deduction for school supplies, reduced taxes on hard cider, and continues to freeze property taxes. Bucks Arena – The Buck Arena language was pulled from the budget during the last week of hearings in the Joint Finance Committee. The language, which would see the state contribute $55 million plus interest, will now be addressed in a separate proposal. Senate Majority Leader Scott Fitzgerald said Wednesday that he hopes the plan can be approved on the floor as early as next week. Open records law – The last minute, controversial proposal was stripped from the budget on the Senate floor. The language would have shielded a vast majority of legislative documents and correspondents from the public. 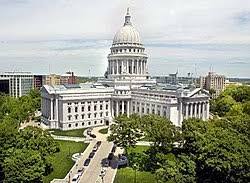 In addition, the Assembly Thursday voted to pass a resolution re-affirming open government in Wisconsin during their floor session. Teacher licensing – The committee eliminated a provision that would have allowed anyone with relevant experience to be licensed as a teacher of noncore academic subjects for grades 6-12. They also eliminated the language allowing anyone with a bachelor’s degree to be licensed in core subjects; English, math, social studies, and science.